I was practicing my presentation for the Handcrafted Soap and Cosmetic conference and my phone rang. The woman who called said her name was Deborah and she purchased my soaps at a garage sale. She wanted to know if I still made them. I had a split second to choose. Be upset or be grateful. I could easily be really upset. 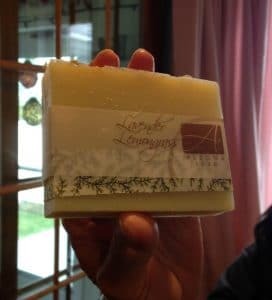 Someone bought or received my soaps as a gift, didn’t like them and sold them at their garage sale. How could someone not like my soaps? I mean, even if they aren’t your favorite, it’s soap. Everyone uses it, right? Why would you sell them at your garage sale? My feelings could easily be hurt and I knew that was not where I wanted this conversation to go. Deborah had bought my soaps and loved them. In fact, she loved them so much she found the card that was in the bag and called me because she wanted more. I took a deep breath and chose to be grateful. I told her yes, I still was making soap. She told me that she had purchased a bag of 4 soaps, and the Lavender Lemongrass was her favorite. We talked for a few minutes and I asked her if she would she like to come to my Open House on Saturday. Deborah came with her friend Jeannine. I showed them my soap studio and told them I was grateful they found me. They both bought some soap and Deborah held up her favorite bar so I could take a picture. My soap ended up in the hands of someone who loved it and she even shared it with her friend. How could I not be grateful for the person who didn’t like my soaps? I had a split second to choose. Be upset or be grateful. I’m so glad I chose to be grateful. This is the perfect “when life gives you lemons” story. I’m so glad you were able to find new, dedicated customers. Yup Kristen, it really was! Deborah and I hit it off and laughed about the garage sale. She said she’s now my biggest fan and that was why she brought Jeannine. Thanks Emy, I’m finding that looking at things in a positive light gets easier the more you do it. Everything happens for a reason! Great job looking on the bright side. Deborah was so happy she found me, and I’m happy she did too. A win for both of us! You never know where the next customer will come from. I am glad you chose to be grateful. That is so true Sharon. Your next customer could be the person standing in line behind you in the grocery store. Always put your best foot forward. What a great story. Your always positive vibes helped you find each other. Thanks Donna, I like that! Hi nice article, thank you for sharing.. handmade soap is the best one to protect the skin.